We all know that plumbing is hidden in our walls, behind our cabinets, and other out-of the-way places. Because of this, it’s sometimes easy to forget that it’s there. The sad truth of it is that when you forget about our plumbing and don’t properly maintain it, there can be serious problems that result in costly damage to your home. The good news is that there is a solution when your home does need maintenance or repair. 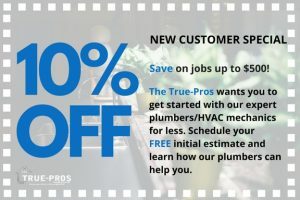 When you have a plumbing maintenance plan through a professional service like True-Pro, it can help prevent minor issues becoming major costly projects. With over 25 years of experience working on any and all plumbing issues, we know what the impact of maintenance and repair can have on your home. With thousands of projects under our belt, we hold licenses in both Florida and New York. We don’t limit our technicians on what they are allowed to do, like other plumbing companies. The only thing we care about is that they fix your home’s issues as easily and speedily as possible. We are a full-service plumbing company that is there to help you get your home’s pipes in the best condition that we can.